Hi all! It’s time for another episode in the Tried and True Recipes series, this time it’s all about comfort foods! Fall is in full swing, and I find myself craving foods with rich, complex flavors. In case you think that finding those on a low-fat, plant-based diet is a challenge, I’m going to show you that it’s not hard at all: the recipes below hit the spot without containing lots of added fat, except for one of the desserts that’s nut-based. Read on, and get your comfort food fix without busting your waistline! Check out other episodes in the Tried and True series over here. 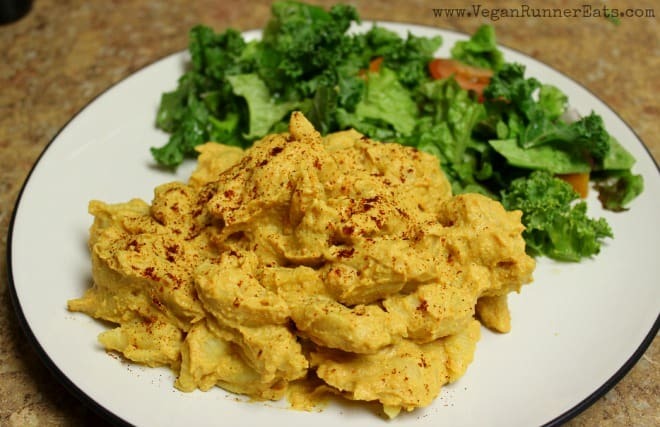 A few weeks ago, I came across this recipe for smoky macaroni and cheese from My Darling Vegan blog, and immediately realized that I HAD to make it that very night! I had a challenge, however: the recipe called for soaked cashews, but I knew that I didn’t have any cashews at home, and even if I bought some after work, they wouldn’t have enough time to soak. So I used a quite radical substitution once I got home: I plopped a whole 12.3-ounce block of firm tofu in a food processor along with the rest of the sauce ingredients! The sauce came out perfect – smooth, creamy, and silkier than it would have been if I had used cashews because my food processor doesn’t blast nuts into a smooth paste like a Vitamix blender would. So if you decide to make this mac’n’cheese, you have my blessing to use either tofu (my proven method) or cashews like in the original recipe (I’m sure it’s delicious with those too). 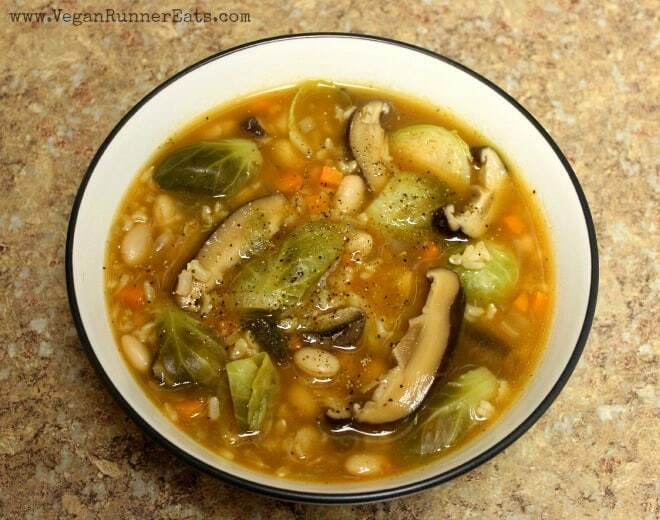 A similar thing happened to me when I stumbled upon this recipe: Susan from Fat Free Vegan posted a link to this Brussels sprouts-shiitake mushroom soup on Facebook, and I knew right away that I had to make it for dinner that night! It helped that I had just the right amount of Brussels sprouts at home waiting to be used up, plus I pretty much look for any excuse to cook the gorgeous dried shiitake mushrooms I picked up at Uwajimaya, Seattle’s biggest Asian grocery store, a few weeks ago. (I prefer using dried shiitake because they are less expensive and last way longer). When I lived in Russia, hearty soups like this were a big staplein my family’s diet, especially in colder fall and winter months. Aside from the addition of Brussels sprouts and shiitake, this soup tasted just like something my mom would have made for us back in the day. Needless to say, I loved the richness of flavor and texture, and the ease of preparation. I sprinkled my bowl with a bit of chile powder to infuse it with some smokiness, and the soup turned out to taste a lot like gumbo! One thing I would do differently next time – I’d add the Brussels sprouts in the last 5-10 minutes to keep them from overcooking. I think a lot of us vegan/plant-based folk can agree that once we switched to this way of eating, we discovered so many recipes and cuisines that were unfamiliar to us before. That’s one of my favorite things about vegan diet – it’s not about what we can’t eat, it’s about expanding what we CAN eat. This recipe for Tofu Cacciatore from Healthy Girl’s Kitchen blog falls exactly under that description – I never tried the original chicken cacciatore before I quit eating animal products, but I sure loved this recipe when I first made it! Wendy’s blog helped me a lot when I first went vegan in 2013. 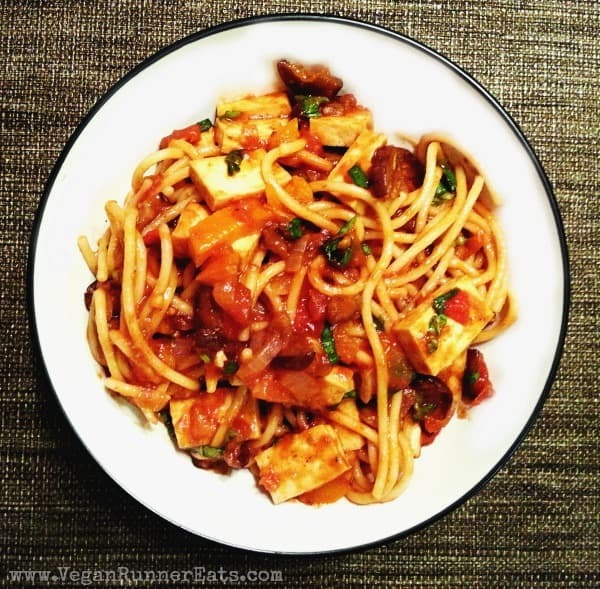 Her tofu cacciatore was one of the first vegan, oil-free recipes I’ve ever made. Whenever I make it these days, I use one substitution: I omit fennel and add some roasted eggplant. I know, fennel and eggplant are not on the same line as, say, onions and shallots, but this is how I made it the very first time, and both Rob and I enjoyed it quite a bit. One day I just might make it with fennel though to see what I’ve been missing. 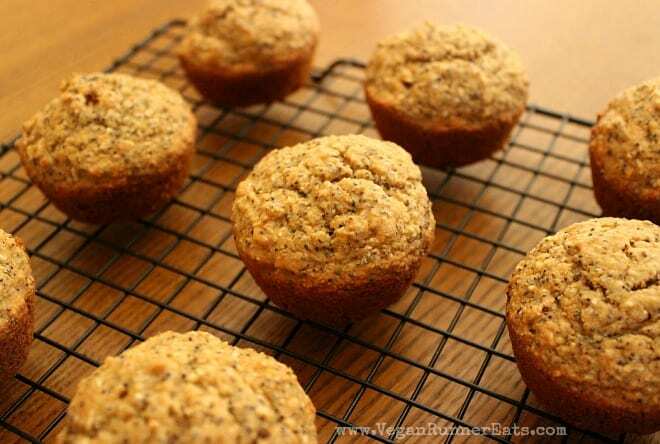 One more recipe from Healthy Girl’s Kitchen, these Lemon Coconut Chia Seed Muffins came to my attention when I was in the mood for everything lemon-poppyseed. Once again, I made a couple changes: I substituted half of the chia seeds with poppyseeds, used whole wheat pastry flour only (I didn’t have barley flour on hand), and mixed in 1 Tbsp of coconut flakes to make up for the absence of coconut extract. The substitutions worked out just fine: the muffins were moist and fragrant, and my lemon-poppyseed craving was satisfied perfectly. I found that there was no need for coconut flakes as they don’t really add much to the flavor, so feel free to omit them – or use coconut extract like Wendy’s recipe suggests. With this recipe, I followed the author’s recommendations almost exactly except for using coconut oil to make the topping – I found that melted chocolate chips did the job just fine without the addition of oil. I kept the pie in the freezer overnight, and then tried to eat it both just out of the freezer (still frozen) and defrosted for 30 minutes. The second version turned out more appealing: once defrosted, the pie had a nice, soft texture similar to a cream pie, whereas the frozen slice had some ice crystals – no biggie, but it may be a turnoff for some of us. The crust was delicious! Verdict: it’s a good pie, but more of a once-in-a-while indulgence since it has 3 ¼ cup of nuts between the crust and the filling. That’s it for today! It’s very likely that the next episode of the Tried and True Recipes series will be fall-themed again since we have this season’s biggest food holiday approaching (yes, I’m talking about you, Thanksgiving!). Until then, feel free to browse the previous episodes of this series over here. Stay in touch with Vegan Runner Eats by subscribing in the top right corner of this post, or by following the blog on Facebook, Twitter, Google+ and Instagram! 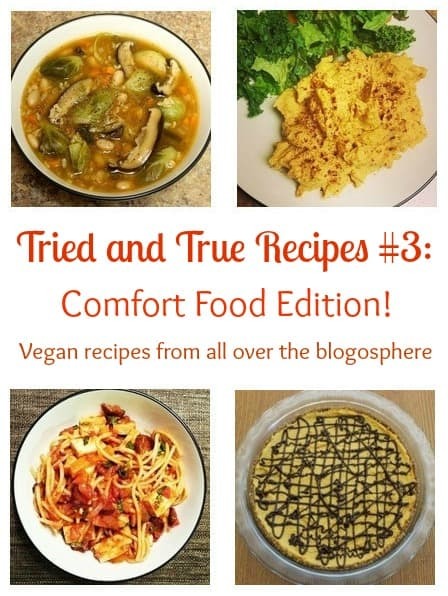 Tried and True Vegan Recipes Series, Episode #2: Five Recipes From All Over The Blogosphere, Tested And Reviewed! 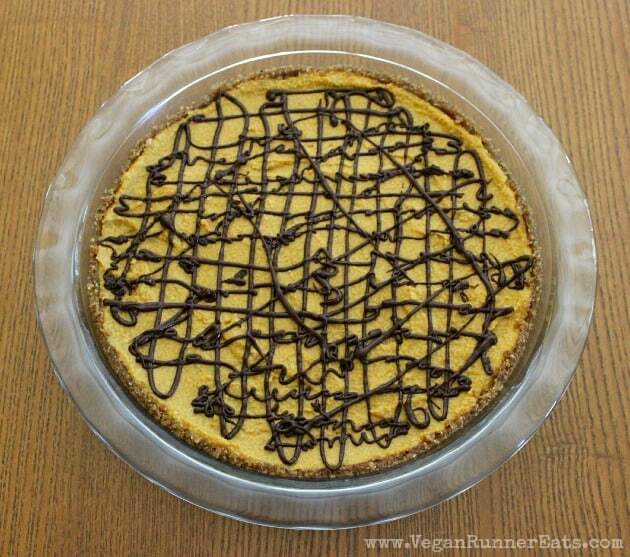 Tagged comfort foods, Fat Free Vegan, tried and true recipes, vegan blogosphere. Bookmark the permalink. Alina first made a switch to a vegan diet in 2013 to optimize her athletic performance as a marathon runner. Being vegan eventually opened her eyes on the issues of animal welfare, environmental protection, human rights and feminism. Alina hopes that her blog will help its readers on their path to making this world a better place. Welcome to Vegan Runner Eats! My name is Alina, and I write about easy and delicious plant-based food, vegan parenthood, and staying fit and healthy as a mom. Click here to find out more about me and this blog! How to Cook with No Oil: 8 Useful Tips. Vegan Kitchen Simplified Series. All content © Alina Zavatsky, Vegan Runner Eats 2013 -2019. Vegan Runner Eats | Powered by Mantra & WordPress.